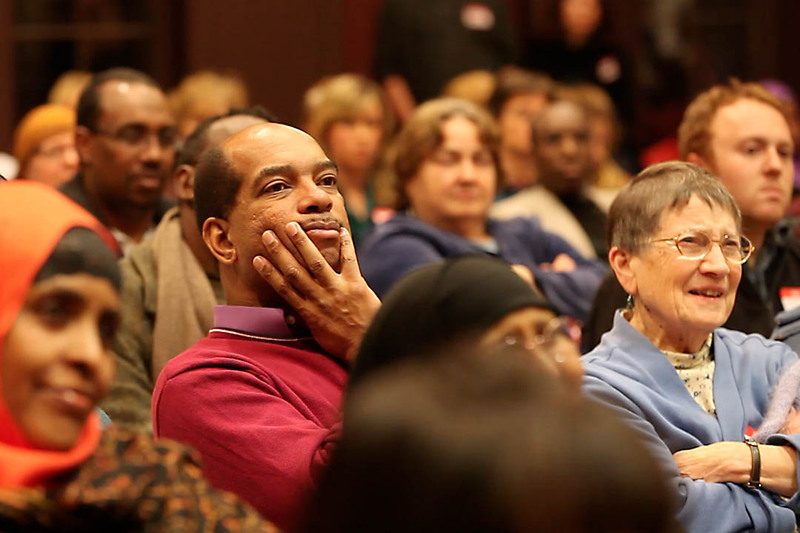 The Many and One movement in Lewiston-Auburn, formed to support the local Somali community, reached a peak with a massive rally in packed Merrill Gymnasium on Jan. 11, 2003. The Many and One rally in Merrill Gym on Jan. 11, 2003, sent a strong, unified message far and wide. Photograph by Phyllis Graber Jensen/Bates College. Ten years later, at Lewiston Public Library, an anniversary gathering recalled and celebrated that transformative day. The program featured city and community leaders, among them Heather Lindkvist, a Bates anthropolgist who is special assistant to the president for diversity and inclusion, and Sarah Davis ’10, who during her time at Bates led or took part in various programs that help integrate new immigrants and refugees into the Lewiston-Auburn community. 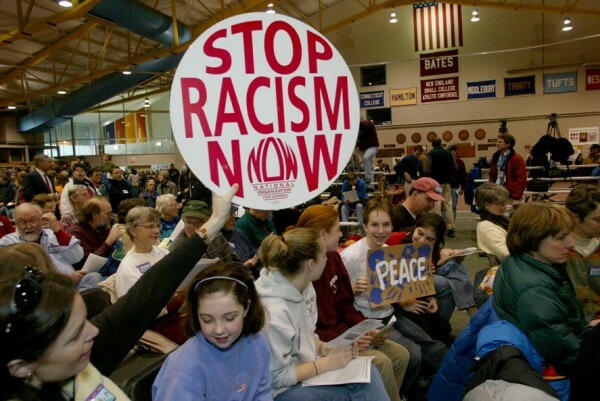 In 2003, the Many and One rally sought to drown out the message of hate at another rally that same day, by the white supremacist group World Church of the Creator. Associate Dean of Students James Reese listens to the speakers at the 10th anniversary of the Many and One rally, held at Lewiston Public Library on Jan. 11, 2013. Photograph by Phyllis Graber Jensen/Bates College. View story from the Sun Journal, Jan. 12, 2013.